Our gentle cleansing wipes are designed to safely clean your goat udders before and asking milking. A healthy animal is a happy animal. When goats are healthy they are known to live longer, put on more weight, and produce more milk. 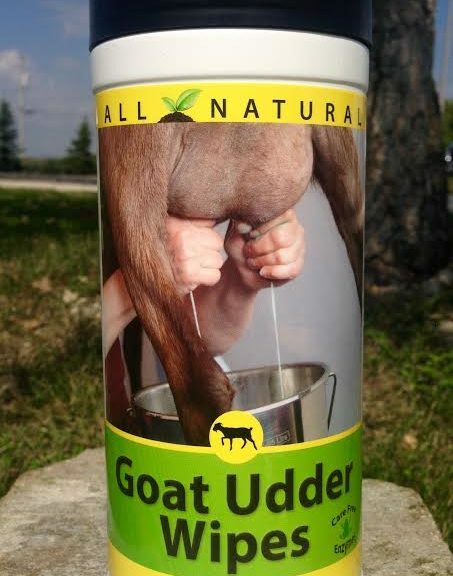 Our non-toxic goat udder wipes can be used to remove oils, dirt, secretions, and odors from goat udders. Goat Udder Wipes help to prevent infection and inflammation while soothing hot spots and helping to ensure the continued health of your animals. ALL of our products are made with natural enzymes and plant oils without the use of ANY harsh chemicals. When used as directed, they are completely child & animal safe. We pride ourselves on making effective products that are safe, natural, & cost effective.